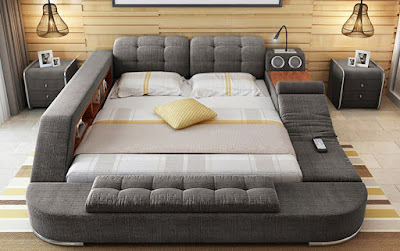 NEWS: Behold the ultimate bed! Beds: to be honest, they haven't changed much in the past few centuries. 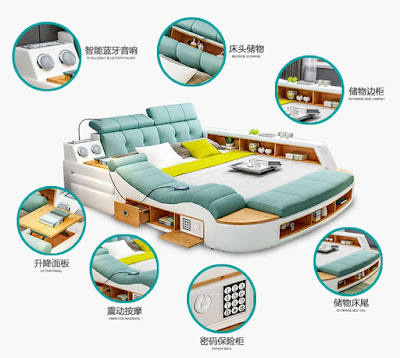 Surely it's about time the humble sleeping platform caught up to the 21st century, and that is exactly what this mega bed out of China has achieved. More than just a place to doze off, the Ultimate Bed is a total entertainment and relaxation station. With space in the centre for a couple of people to snuggle and cuddle (or even better, just one person to spread out), the Ultimate Bed has been designed to feature everything you need and want in the bedroom, without you having to get up. There is a handy bookshelf to one side, a fold out table to the other, a bendy light, and a built in speaker. As well as that, there is under-bed storage, and also a safe built right in to one side. For 'personal' items, perhaps. If you thought that was all pretty awesome, there is also a vibrating massage seat, too. So you have a great night's sleep, then start the day off with a massage. Sounds ideal. However, if you really one, you might have to sort out shipping from China, as it is currently only available there. Damn those relaxed, well catered for in bed, Chinese!